Air comprises gases and water moisture. The gases are mostly nitrogen (78%) and oxygen (21%). The amount of water moisture in the air is expressed as a relative humidity with typical values of comfort for people between 20% and 65%. When we heat or cool air, we are heating or cooling the gases (which is called sensible heat) and we are heating or cooling the water vapor (which is called latent heat). The cooling process often removes water vapor from the air. This is commonly seen as water running from an air conditioning system. A large amount of energy is required to heat or cool the water in the air. It is therefore important that we know both temperature and relative humidity to calculate how much heating or cooling is taking place. It is especially important if we want to show a change or improvement to a heating or cooling system. We measure the temperature of the air with a thermometer. Traditional thermometers have a bulb that contains a liquid that expands, and a tube indicating the temperature on a scale. As the liquid expands, it rises up the scale. In the HVAC business, we use a thermocouple and electronic meter because these are faster and more rugged. Whichever method is used, this measurement is called the dry bulb temperature because the end of the thermometer that is making the measurement has no moisture on it. We can measure the relative humidity in a variety of ways, but the simplest way is to measure the wet bulb temperature and use a chart or calculator to find the relative humidity. The wet bulb temperature is measured by having the bulb of the thermometer moist. The moisture evaporates, lowering the temperature recorded by the thermometer. Less moisture in the air will result in a faster rate of evaporation and therefore a colder reading. Electronic methods of measuring the relative humidity are faster but less accurate. Typically these devices have ±3% accuracy. They calculate the wet bulb temperature after measuring the dry bulb temperature and relative humidity. The amount of heat in air is referred to as enthalpy1. In the US, the enthalpy of air (in the HVAC business) is measured in BTUs per pound of air. Elsewhere it is measured in kilo-Joule per kilogram (kJ/kg) of air. The enthalpy is to a close approximation directly related to the wet bulb temperature. You can see the relationship on a psychrometric chart2. Alternatively, you can use the graph below. This graph is valid at sea level and 50% relative humidity and is a close approximation at other altitudes and levels of relative humidity. ​If we measure the wet bulb temperature before and after the evaporator of an air conditioning system, we can estimate the heat in the air before and after the evaporator. The difference is the heat that is removed by the evaporator and therefore the heat that is removed by the air conditioning system. The enthalpy value gives us the amount of heat in a pound of air. To know the total heat removed by the evaporator, we need to know the rate of flow of air that passes the evaporator. However, for our purposes, this actual number is not required. This is addressed in section 7. This measurement of heat removal by the air conditioning system is independent of the ambient temperature outside the building and also independent of the actual temperatures of the room itself. If we calculate the heat removed by the air conditioning system prior to treatment with the SRA and then we perform the same calculation after treatment with the SRA, we can quantify the change of the system’s efficiency. As noted above, this calculation can be made even if the ambient conditions are different when the first measurement is made and the second measurement is made. Also, as stated above, we do not measure the actual rate of flow of the air. We assume that when we make the first set of measurements (before treatment with the SRA) and then we make the second set of measurements (after treatment with the SRA), that the rate of flow of air (cfm) is unchanged. This is a valid assumption under most circumstances. However, if the humidity of the air has altered significantly, the flow rate will be higher when the air has more water. Therefore, the two measurements should be made when the relative humidity is similar. 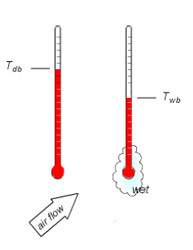 If we wanted to know the exact amount of heat change, we would need to measure the rate of flow of the air. This would provide accurate values for the heat, calculated as follows. If we do not want to measure the flow rate, we can estimate that for a standard air conditioning system, the system is designed to move 400 cfm (cubic feet per minute) per ton of air conditioning over the evaporator. This means that the system is approximately a 2½ ton system1. If we substitute equation 4 with the enthalpy value after treatment of 10.0 BTU/lb then the heat absorption is 34,900 BTU/h or approximately a 3 ton system. As stated above the actual flow rate, if constant, is immaterial to calculating the gain in efficiency. If we measured the difference in dry bulb temperatures before and after treatment with the SRA, we cannot easily deduce the gain in efficiency. In the example above, the delta-T before was 78°F–65°F=13°F. The delta-T after was 77°F–60°F=17°F. The delta-delta-T is 4°F. Some have advocated that for each change in delta-T (delta-delta-T) of 1°F, there is a change in efficiency of 7%. If that was the case, we would conclude that the gain in efficiency is 28% and not the 16% that actually happened in our example in section 6. The power consumed by an air conditioning unit changes with the work being done by the air conditioning unit. If the outdoor ambient temperature increases (where the condenser coil is located), the air conditioning unit has to work harder to expel the heat. This results in greater power used by the compressor. Conversely, a reduction in ambient temperature results in less power being used. If the heat inside the space changes, the air conditioning system has to remove more or less heat from the space. If there is greater heat internally (because of the increase in people, or the use of cookers, computers,or copying machines), then the air conditioning system will work harder. Measuring the power consumption when there is a change of ambient or load conditions will lead to results that are not easy to predict. For this reason, we recommend that when using the method in this application note to measure a gain in efficiency, that you make the measurements before and after treatment with the SRA under similar ambient and load conditions. In this case, it is not usually necessary to measure the power consumption of the compressor. However, it is likely that power consumption will decrease (because the compressor is working less) and therefore, if possible, you should record power consumption. Whether you measure power or not, ensure that the ambient temperature before and after are similar (within ±3°F), and that the load conditions inside the building are similar. If there is much variation, we suggest you return another day when the conditions are comparable to make the second set of readings. This application note has shown that by measuring wet bulb temperatures before and after the evaporator we can deduce the heat absorption in the evaporator. If we make these measurements before and after treatment with the SRA we can deduce the gain in efficiency. This is a reliable method that is valid regardless of changes to the outside ambient conditions and holds true over a range of humidity values. The measurement of wet bulb is simple and accurate. Follow these steps to perform the analysis described in the preceding pages. Put the readings of temperature and calculation of enthalpy into the table on the next page. 11.2.1 Measure the outdoor ambient temperature (as a dry bulb measurement). 11.2.2 Wrap a small amount of the tissue on each end of the thermocouples and hold it in place with a rubber band. Wet the tissue so that it is moist but not dripping. 11.2.3 Place the thermocouples before and after the evaporator. If you cannot access the unit itself, place them at a supply vent and a return vent of the space being cooled. 11.2.4 With the a/c unit operating, measure and record the wet bulb temperatures. 11.2.5 For greater accuracy measure the dry bulb temperatures at the same spot by removing the wet tissue and drying the thermocouples. 11.3.1 From the psychrometric chart or the enthalpy chart, determine the enthalpy that corresponds with the temperatures. 11.3.2 Subtract the two values to obtain the heat absorption by the a/c system. 11.4.1 Treat the a/c system with the SRA using Power Knot’s procedure. 11.4.2 Keep the a/c system running and wait approximately 30 minutes for each ton of air conditioning. For example, for a three ton system, wait 1½ hours. 11.5.1 Repeat the steps in section 11.2 and section 11.3 to calculate the heat absorption by the a/c system after treatment. 11.5.2 Calculate the gain in efficiency as outlined in equation 1.